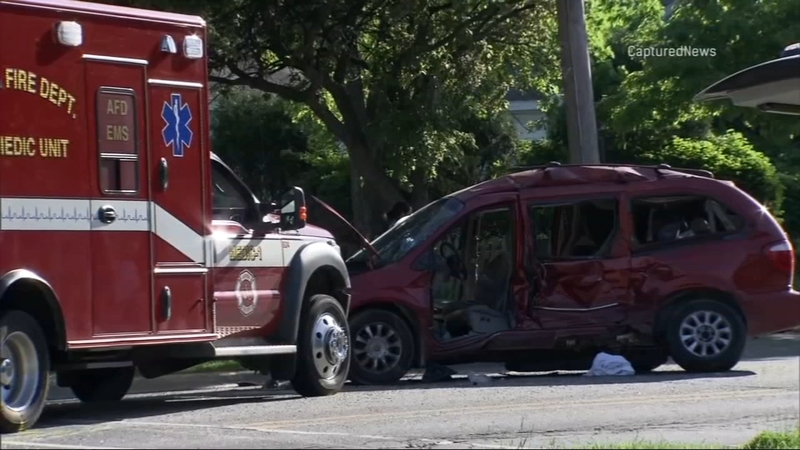 CHICAGO (WLS) -- The driver of a minivan that collided with an ambulance in Aurora on Wednesday, injuring 11 people including 6 children, has been charged for failing to yield at a stop sign. Aurora police said the 25-year-old Chicago man failed to see a stop sign at the intersection of Galena Boulevard and West Street and instead continued into the intersection. At that point, police said, the ambulance, which was driving westbound on Galena with its lights and siren activated and a patient inside, t-boned the minivan on the driver's side. In all, 11 people were injured. The driver was also cited for failing to secure a child in a child restraint seat. "It was really loud. It was a quick one-second siren and then a bang. And it just startled all of us," said Rick Cotts, witness. Cotts and other neighbors rushed to help. Surveillance video from nearby homes showed witnesses running to the scene. Police said the minivan contained the driver, a 27-year-old woman was in the passenger seat, and six children: a set of 1-year-old twin boys, a 4-year-old, a 6-year-old, a 12-year-old boy and a 13-year-old girl. Officials said the woman was the children's mother. "The youngest one, he was laying down on the floor. Paramedics were trying to help him but he wouldn't respond, so they right away called an ambulance," said Arelli Saldivar, witness. One of the 1-year-old boys and the 12-year-old boy were taken to a Chicago hospital for serious head wounds, police said. "Three of them, from what I saw, were unconscious. And the older sister, she was like pretty hysterical, crying. You know, 'wake up!'" Cotts said. Aurora police said Thursday that everyone involved in the crash except for the two children flown to a suburban hospital had been released. The conditions of the two children who remained hospitalized was upgraded to stable, police said. The two Aurora Fire Department paramedics and the patient in the ambulance were treated for non-life threatening injuries.